Final Girl: Day 13: "Master, I did it! I summoned you!" I will not hear a word against the shaggy rock stylings of Stoneground. 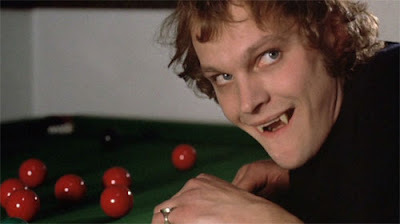 My favourite parts of 1972 are the policeman giving a cheeky grin to the hippies having it off under the banquet table, and the breakthrough moment when Van Helsing sits down with a pen and paper and works out the shocking truth behind Alucard's surname. And of course the spectre of "ghastly, horrible, obscene murder". I always got a kick out of the main title theme. 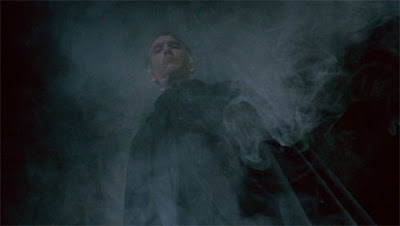 You keep waiting for the voice to say: "Dracula A.D. 1972! A Quinn Martin production." As klunky as the music is within the film, it grooves pretty well as a soundtrack and is worth seeking out on CD. Hard to believe that Caroline Munro was asked to play a teenager (in the beginning) in Slaughter High 14 years after this film was released. My favorite part is when Prof. Van Helsing has to actually write out "ALUCARD" and "DRACULA" on a card, then diagram the letters to realize that it's "Dracula" spelled backwards. I used to have such a crush on Caroline Munro. I'm not sure why I'm divulging such information, except to state that I still have a crush on Caroline Munro! Ah ye..."ALUCARD"---"DRACULA". Wow, Van Helsing's a little slow on the uptake! The prologue was possibly the most egregious day-for-night...I don't think they bothered to try to hide it! 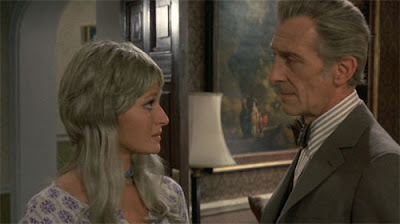 Ah, Stephanie Beacham's side mullet wig. WTF was someone smoking when they designed that dead poodle? 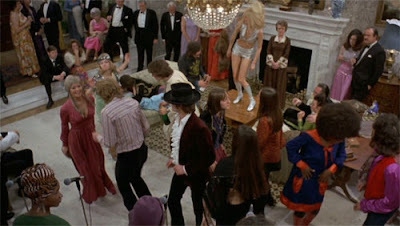 I hope Ms. Beacham was paid extra for having to wear that foppy mop. 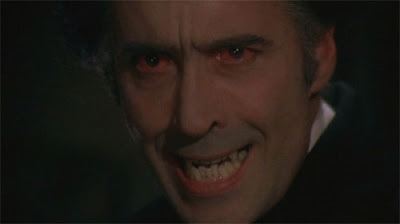 Clearly, Hammer was looking to crank out a couple more Dracula flicks before Christopher Lee really got too long in the tooth. The movie is 100% marshmallows-over-the-fire campy, but tons of fun. 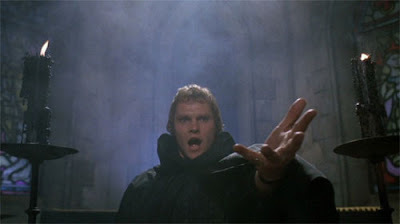 "You said, "This penultimate film in Hammer's Dracula line..." Um, not quite: The Satanic Rites of Dracula"
Personally, I've never counted 7 Golden Vampires when I think of Hammer Dracula flicks. 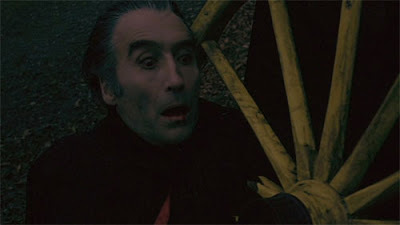 It was a co-production with the Shaw Bros, and I'm also talking Christopher Lee as the Count. "..and of course you know my good friends Dr. and Mrs. Nietsneknarf..."
I was disappointed too to see the loverly Caroline Munro exit the film's proceedings so early. But the devilish look in her eyes as the Count bites her is a sheer delight. Not a good film yet a fun one as you say. 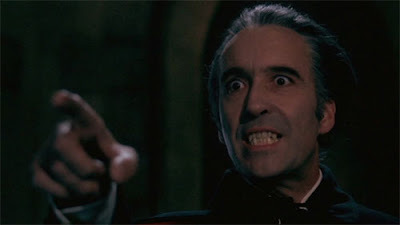 But I have to say that Hammer Film's Dracula is one clumsy incarnation of evil isn't he? He's always blundering out into frozen rivers, getting stuck by lightning or impaled by wagon wheels. Maybe they should have made a film called ASTIGMATISM OF DRACULA.